Alastair Cook hit an unbeaten century in an unbroken stand of 153 with Samit Patel to rescue England on day two of their tour match against India A.
Cook, in his first match since being named Test captain, was 112 not out, with Patel 82 not out as the tourists recovered from 133-4 to close on 286-4. Kevin Pietersen had earlier been caught and bowled by Yuvraj Singh for 23. Jonathan Trott made 56, but Nick Compton was out for a third-ball duck as England replied to the hosts' 369. "I don't think the selection of Samit Patel against India A means he is a shoo-in for the Tests. If these pitches are going to turn, England are going to need two spinners to take 20 wickets and that means playing Graeme Swann and Monty Panesar. If, however, they think a pitch is not such a turner but will offer a little bit of assistance to the slow bowlers, then Patel comes into the frame as a batsman who can take some of the burden off Swann with the ball." With pace bowler Steven Finn withdrawn from the match because of a thigh injury, the failure of Compton completed England's early morning disappointment. The Somerset man, chosen to open ahead of Joe Root to stake first claim on the slot vacated by the retirement of Andrew Strauss, left his first two balls then edged an outswinger from Ashok Dinda behind. But that setback for Cook's men was tempered by the significance of the effort from Patel, who increased his chances for inclusion in the Test side. In his two Tests to date the Nottinghamshire man batted at number seven, but he was promoted ahead of Matt Prior to six in Mumbai. "I don't mind where I bat," Patel told BBC Sport. "You have to adapt to different situations in the game and I'm happy to do that for the team. "It's good to get runs in the first tour game and that's going to do a massive amount for my confidence. "There's different tactics we could use in the Test matches so I have to keep going." Patel was dropped down the leg side by wicketkeeper Wriddhiman Saha when on 29, with a similar piece of good fortune going to Cook when he was put down by the same man off Yuvraj. Aside from that, Cook showed all his trademark concentration and discipline, with the most memorable moment of his 251-ball stay coming as he leaned on a cover drive off Yuvraj to move through the 90s. Soon after, a single to mid-off completed his century with familiar understatement. In contrast, Pietersen's first innings knock back in the England fold was frenetic before ending in habitual fashion. The right-hander lofted Raina for a straight six as he scored at almost a run a ball, but Yuvraj - the man Pietersen called a "pie-chucker" on England's last visit to India four years ago - became the latest left-arm spinner to claim the Surrey man's wicket with a smart return catch. 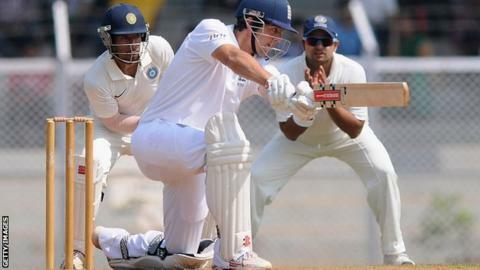 Yuvraj had more success when Ian Bell edged to slip for only five, but, from there, Cook and Patel took over.